"In this part of the world, unfortunately, the normal is the exception. It is the irrationality and the abnormality, the racism and the extremism that is prevailing today in the Holy land which has been taken by the Devil." The Israeli-Palestinian conflict is one that can provoke strong, one might even say extreme reactions. I myself have had to step in to stop a shouting match on the subject from developing into a punch-up, and have listened to otherwise perfectly rational people make outrageously sweeping statements about one side or the other. One of the most frequently repeated comments casts every Palestinian as a potential terrorist, a view given undue weight by the might of the Israeli state and its influence in the West. It is this belief that was at the heart of the decision by the Israeli government to erect a 681 kilometre barrier along the West Bank to divide the Israeli and Palestinian population of the region. The project is a long term one that will take many years to complete and is being constructed from a mixture of interlocking concrete sections, vehicle trenches and densely packed barbed wire. By January 2006, three years after the project commenced, approximately 31% was completed and a further 31% was under construction. Supporters of the barrier refer to it as The Fence. Its opponents call it The Wall. Documentary film-maker Simone Britton uses her Jewish-Arab background to examine the nature of the barrier and its effect on the population living around it from both sides of the divide. In the process, she encounters some unsurprising attitudes, from those on the Palestinian side who equate it to a prison wall, to the claim made by director general of the Israeli Ministry of Defence General Amos Yaron that it is a necessary weapon against Palestinian criminal and terrorist activity. But Britton also uncovers some intriguing examples that kick against the expected, most memorably the Arab construction workers who are helping to build the barrier, grateful for the work in an area with few job opportunities and no social security. The film kicks off in captivating fashion with a close to three minute track along a lengthy section of the wall that has been fabulously decorated in a variety of artistic styles, while the off-camera voices of Israeli children explain to the enquiring Britton the purpose of the wall. "They shoot Arabs from here," says one, only to have his friend say, "No. Arabs shoot at us." "Who shoots at who?" Britton pertinently asks, but gets no reply. It is just such casually delivered comments that provide some of the film's most insightful moments, as pedestrians approach the film-makers and pass comment on the barrier and its impact on their lives. Often arrestingly shot, the editing pace seems almost too leisurely at times, with shots held for far longer than would normally be expected and not always with obvious purpose, creating the sense of an hour-long film that has been stretched out to 90 minutes. Actions and places are observed, and lingering on them sometimes creates the sense of a point being laboured. But more often than not the message is conveyed precisely by letting the shot roll on uninterrupted, as with the Israeli patrol guard who checks the identity of Palestinians attempting to pass through the barrier but who ends up stopping a succession of Israeli citizens leaving an area in which they should not have been in the first place and admonishing them with steadily increasing severity. 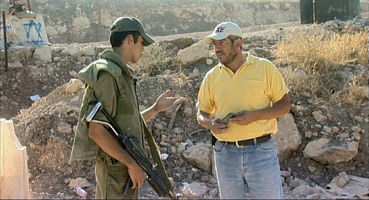 Britton and her crew never appear on camera but intermittently become part of the story they are telling, as they are questioned by passers-by, challenged by a soldier only after they have spent some time filming him, and asked if they feel unsafe working in the area by an Israeli who believes that the barrier is an ultimately ineffective waste of money. It is he who brings the reality of suicide bombings down to a personal level. "Have you ever found yourself standing next to a bus?" he asks Britton. "When you stand next to a bus, pray for the light to be green. That's what I do." Anyone with even a passing knowledge of the area's troubles will understand the implications of that statement. The politics of the situation are never really engaged or even introduced, and a degree of knowledge of the conflict, the locale, and even the wall itself is assumed. The film focusses not on the wider issues, but on the barrier and those living within its metaphorical shadow. Although largely even-handed in its range of interviews, the wall is never really seen in a positive light, making large profits for an Israeli concrete manufacturing firm but robbing land from Palestinian farmers, on whose side of the divide the barrier has been constructed. Neighbourhoods find themselves cut in half, frustrating even those on the Israeli side who would like to get to know those who live just a few metres away, while others find their route to work now blocked. One Palestinian man even tells of a social divide within his own family, separating those who have Jerusalem ID cards from those who do not. It is perhaps a little ironic that the most passionate and reasoned case made against the social injustice of the barrier is made not by a penniless West Bank inhabitant, but a comfortably-off Israeli. Although Wall tends to nibble where I wish it would bite, these nibbles are numerous and cumulatively effective. Even Amos Yaron presents the case for the barrier in increasingly unconvincing terms, becoming gradually agitated with the questioning and detailing an overkill of security measures that are shown to be completely ineffective when locals are filmed moving freely and easily across the divide. But it's the small moments, the lingering shots that at first seem a little too lingering, that really hit home – the landscape slowly blocked out of the picture by concrete wall segments, the village dominated by an armed watch tower that sits on the hill above, the segment of wall that has been lovingly painted to resemble the more tranquil scene that lies beyond it. 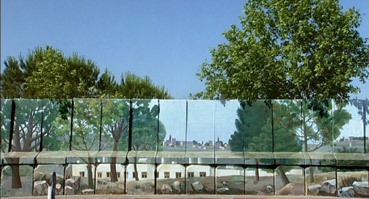 Britton ends her film on a repeat of the opening shot, but on a section of the wall where there are no paintings to beautify this concrete and wire exercise in social division and control, only scrawled graffiti. Here the wall is already in disrepair, patched up by concrete blocks and topped by ragged barbed wire. It is here that the dour reality and ugliness of the project is most poetically expressed, and as we watch one girl effortlessly scale it and an old woman holding her hand against the concrete as if attempting to reach beyond its confines, the cruelty and pointlessness of the multi-million dollar construct is quietly but very effectively made clear. Shot on what looks life DigiBeta or High-Def, the transfer has been taken straight from the digital master and is frankly pristine, with excellent colour, contrast and detail and solid black levels throughout. This really does justice to Jacques Bouquin's eye-catching and tellingly framed compositions. Yes, digital video can be beautiful too. There is no call for a flashy 5.1 soundtrack here and the Dolby 2.0 stereo track serves the film well, reproducing the dialogue, location sound and music with impressive clarity and dynamic range. 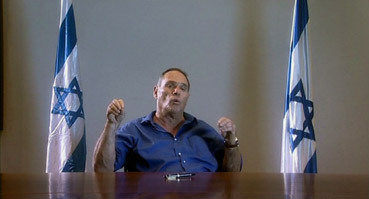 The are two conversations with Simone Britton, the first between her and Palestinian filmmaker Elia Suleiman (30:31) in which the two discuss in English the film, its structure and its purpose, and Britton talks in detail about her views on the Israeli-Palestinian situation, as well as passionately explaining just why she cannot imagine ever making a fictional feature. In the second Britton talks with another Palestinian filmmaker, Michel Khlefi (29:11), about the film and the underlying social politics of the wall and the conflict. A key revelation occurs at the start when Britton, who shot the film in 2003, states that if she was making the film now it would be far more serious due to how far she believes things have deteriorated in the region. He views on the conflict are again made plain, especially when she suggests that the wall was built because of "the Israeli disease." She also explains how she came to make the film, and the two discuss the experience of growing up in different cultures in the same country. Pleasingly, there is almost no overlap between the two interviews, both of which are useful companions to the film, although I would suggest that both Britton and Suleiman smoke too much for their own good. The Khlefi-Britton discussion is in French with English subtitles. A stern whisper of protest rather than a cry of righteous anger and a bit too leisurely paced at times, Wall nonetheless succeeds in humanising an issue usually discussed in purely political terms. That it takes sides will no doubt prompt those who do not agree wholeheartedly with Britton's viewpoint to dismiss the film as propagandist, but the points made are all valid and these voices have as much right to be heard as any other. Whether the film will find an audience on DVD is another matter – there are few surprises here for those already familiar with the politics and the situation, while the lack of background information does not make it the ideal introduction to the complexities of the Israeli-Palestinian conflict. But it is a worthwhile and involving documentary, and could well prove a useful tool for those looking to clarify to others a situation in which the human issues are too often lost under the weight of sweeping statements and simplistic judgement. And with the situation in the Middle East as volatile as ever and the American government considering a similar barrier between its southern border and Mexico, this release could not be better timed.